We advise all bidders to read the Terms and Conditions of the Sale before bidding with Dan Morphy Auctions LLC and/or its affiliates Morphy Firearms LLC, and Morphy Auctions, Las Vegas collectively referred to below as MORPHY’S. Those who bid are bound by those Terms and Conditions of the Sale, as amended by any oral announcement, published or posted notices, which together form the contract of the sale between the successful bidder (buyer), MORPHY’S and the seller (consignor) of the lot. When bidding on any lot offered by MORPHY’S, the bidder indicates acceptance of the following Terms of Sale. Any participation in the auction binds you to agreement of these terms whether or not you read or understand said terms. The Terms in writing contained herein are subject to change without notice and bidder agrees that the most recently published Terms of Sale as published or amended on the website at the beginning of the auction shall apply. 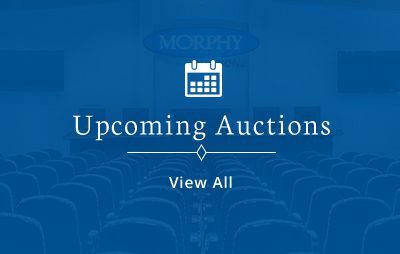 MORPHY’S makes every effort to accurately describe all items offered in its sales, however all items for sale are “as is,” and it is the bidder’s responsibility (present or absentee bidders) to determine the exact condition of each item. MORPHY’S will not be held responsible for typographical errors. Neither we nor the consignor, make any guarantees, warranties, or representation, expressed or implied, in regard to the property or the correctness of the catalog or other description of the authenticity of authorship, physical condition, size, quality, rarity, importance, provenance, exhibition, literature or historic relevance of the property or otherwise. No statement anywhere whether oral or written, shall be deemed such a guarantee, warranty or representation. Prospective bidders should inspect the property before bidding to determine its condition, size and whether or not it has been restored. It is the bidder’s responsibility to initiate MORPHY’S in request for additional information regarding the items. Submit all questions regarding upcoming auction items at least 48 hours prior to the date of auction. We will make every effort to answer all submitted questions in a timely manner. However, we cannot guarantee that questions submitted within 48 hours of the auction date will be answered prior to the auction. The consignor and we make no representation or warranty as to whether the buyer acquires any reproduction rights in the property. Returns will not be accepted under any circumstances. All items will be available for preview approximately one (1) month prior to the auction. All items are sold for display purpose. If electrical, mechanical, or other working parts are inoperable, even if working at the time of sale, we are not liable due to the inherent nature of the age of these antiques and items. Submit all questions regarding upcoming auction items at least 48 hours prior to the date of auction. We will make every effort to answer all submitted questions in a timely manner. However, we cannot guarantee that questions submitted within 48 hours of the auction date will be answered prior to the auction. MORPHY’S will consign the item in your name to the next appropriate auction. If you do not pay for the item in full, MORPHY’S will block you from participating in future auctions. Any gaming device purchased at the auction shall be used for the purpose of display or social entertainment within the private home or residence of the buyer, and such devices shall not, in any event or manner, be exposed to the public for the purpose of gambling or be resold in the state of Nevada without a gaming distribution license. Proof of residence/ID is required for purchase of gaming devices. FIREWORKS – MORPHY’S can only ship Class 1 Division 1.4 and 1.6 Explosives (as described in the following website: http://environmentalchemistry.com/yogi/hazmat/placards/class1.html) per the 49CFR 173.50 and can only ship these via FedEx. All items not shippable must be picked up by the buyer. MORPHY’s is not responsible for a third party grading company agreeing or disagreeing with our assessment, and we cannot issue refunds or credits if cards do not receive a numerical grade or the exact grade that we describe. MORPHY’s strongly recommends that you personally evaluate any items that you are bidding on, and make your own determination about its grade. MORPHY’S offers no guarantee of grade for uncertified items sold and subsequently submitted to a third-party grading service. Cards sold referencing a third-party grading service are sold “as is” without any express or implied warranty. Certain warranties may be available from the grading services, and the Bidder is referred to them for further details: Professional Sports Authenticator (PSA), Sportscard Guaranty LLC (SGC), Global Authentics LLC, Beckett Grading Services (BGS), JO Sports, Inc.
MORPHY’S will not accept return of certified items due to possible differences of opinion with respect to the grade offered by any third-party organization, dealer, or service. Grading does not qualify for return evaluation, nor do such complaints constitute a basis to challenge the authenticity of a lot. MORPHY’s shall not be liable for any patent or latent defect or controversy pertaining to or arising from any encapsulated collectible. In any such instance, buyer’s remedy, if any, shall be solely against the service certifying the collectible. Under extremely limited circumstances related solely to authenticity, such as a highly significant cataloging error, a buyer, who did not bid from the floor, may request MORPHY’S to evaluate voiding a sale. Lots returned must be completely intact in their original form and undamaged holder, or there will be no credit. Certifications are void and returns are not accepted for any cards removed from their third-party grading holder. All elements of the MORPHY’S POST-SALE RETURN POLICY apply. There are absolutely no exceptions to this policy. The bidder shall solely rely upon the warranties of the authentication provider issuing the Letter or opinion, or on the warranties of the authentication provider of the bidder’s choice. Warranty inures only to the original Buyer may not transfer the rights afforded under the LOA, and it is null and void when Buyer transfers or attempts to transfer the lot. The LOA warranty is valid from date of the auction in which Buyer was awarded the lot to four (4) years after its purchase. The LOA warranty is valid as to its attribution to the person or entity described or to the lot’s usage, e.g. game worn. Buyer must contact MORPHY’S within the warranty period, prior to submission of the lot as to his intent to make a claim, receive prior approval, and arrange secure shipment. Buyer must present with the claim, authoritative written evidence that the lot is not authentic as determined by a known expert in the sports field. If MORPHY’S concurs that the lot is not as represented, Buyer shall be refunded their purchase price. If the MORPHY’s denies the claim, the Buyer agrees to the AGREEMENT REGARDING GOVERNING LAW, VENUE, AND LEGAL RIGHTS noted herein. The LOA does not provide for incidental or consequential damages or other indirect damages. Any lot sold with a certificate of authenticity or other warranty from an entity other than Auctioneer or Morphy’s affiliates is subject to such issuing entity’s rules and such conditions are the sole remedy afforded to buyer. In the event MORPHY’s cannot deliver the lot, or subsequently it is established that the lot lacks title, provenance, or authenticity, MORPHY’s liability shall be limited to voiding of the sale and refund of purchase price. In no case shall MORPHY’s liability exceed the winning bid on that lot, which bid shall be deemed for all purposes the value of the lot. After one year has elapsed, MORPHY’S maximum liability shall be limited to any buyer’s premium earned on that lot. Due to changing grading standards over time, differing interpretations, and to possible mishandling of items by subsequent owners, MORPHY’S reserves the right to grade items differently than shown on certificates from any grading service that accompany the items. MORPHY’S also reserves the right to grade items differently than the grades shown in the prior catalog should such items be reconsigned to any future auction. There is a subjectivity to grading, especially the grading of cards. Every effort is made to verify the condition of each lot as it is described. MORPHY’S accepts items for auction after careful scrutiny by not only ourselves, but, when necessary, by other leading authenticators. We cannot guarantee that every card described by us will in all cases receive exactly the same grade, or even be accepted for grading, from any third-party grading service. Similarly, we cannot guarantee that every card graded by one third-party grading service will in all cases receive exactly the same grade by another third-party grading service. Occasionally a lot description will include the words “we have submitted,” which is intended to be taken literally and give bidders great confidence that MORPHY’S has not “done anything” to the cards to alter or otherwise improve their appearance and ultimate grade. No warranty, whether expressed or implied, is made with respect to any grade, condition, or other adjectival descriptions, which can and do vary, even among experts. Large Autograph Group Disclaimer: When dealing with a single individual auction lot containing many items, these lots are offered with the explicit understanding that it is possible that there may be a small percentage which are not authentic. When authenticating large lots, such as a collection of 6,000+ signed 3 x 5 cards, or a set of 700+ signed baseball cards, great care has been taken in the authentication process, with all the greater attention focused on any items representing a concentration of value. It is always possible that on rare occasions a secretarial or stamped signature could be missed here or there. Without this disclaimer, as a practical matter, it would not be possible for MORPY’S to offer such lots at all. All bidders bidding on such lots do so with this understanding. Abbreviation/Definition/Condition Key: PR — Poor, GD — Good, VG — Very Good, EX — Excellent, NM — Near Mint, MT — Mint. NOTE: If an item has a multiple grade such as VG-EX, then that item falls somewhere in between those two conditions. GOODS MADE FROM OR CONTAINING MATERIALS FROM PROTECTED SPECIES – MORPHY’S does not accept any responsibility or liability for the sale of items containing materials from protected species or for any omission in marking or labeling goods as containing materials from protected species. Such material includes, but is not limited to, ivory from elephants and walruses, tortoise shell, crocodile skin, whalebone, rhinoceros horn, some species of coral and certain woods. Restrictions on the importation, exportation, sale, transfer, and/or possession of goods containing materials from protected species derive from international, federal, and state laws and regulations promulgated thereunder. Laws include, but are not limited to, the Convention on International Trade in Endangered Species of Flora and Fauna (CITES), the Endangered Species Act (ESA) and the Marine Mammals Protection Act (MMPA). States currently restricting trade of protected species include, but are not limited to, California, New York and New Jersey. Prospective buyers are on notice that several countries completely prohibit importation of property made, all or in part, of protected materials. Some countries require special permits, such as a CITES permit, from the relevant regulating authority in the countries of exportation and importation as well. Potential buyers intending to import the property into another country should be familiar with the relevant customs laws and regulations prior to bidding on goods containing material from protected species. Regulations may vary as the U.S. generally prohibits importation of articles containing material(s) from species it has designated endangered or threatened if the articles are less than 100 years old, subject to certain exceptions. It shall be the potential buyer’s sole responsibility to research and satisfy the requirements of any laws and regulations that apply to the import and export of property as described in the aforementioned paragraphs. All buyers agree to comply with any and all domestic and international restrictions on the trade of protected species as a condition of the sale. Please note that the ability to obtain an export license or certificate does not ensure the ability to obtain an import license or certificate in another country, and vice versa. It is the buyer’s responsibility to obtain any export or import licenses and/or certificates as well as any other required documentation. MORPHY’S is not able to assist the buyer in attempting to obtain the appropriate licenses and/or certificates, and there is no assurance that an export license or certificate can be obtained. The inability or delay in obtaining permits, licenses or other permissions to import or export goods containing material from protected species will not constitute a basis for rescission or cancellation of the sale of said goods or the delay in payment of purchased items in accordance with these Bidder Terms and Conditions. Jewelry Descriptions and Condition Reports: Lots being offered are sold as-is on the day of sale. Condition reports, either written or verbal, are provided as a courtesy only, and are not to be taken as fact or guarantees of condition or quality of the lots. All information provided is the opinion of the specialist at MORPHY’S, including but not limited to weights, grades, color, and clarity. All gemstones and diamonds are measured and graded in their setting unless stated otherwise. All weights and grades are approximate. Buyers wishing to have a grading or gemological report from an independent, internationally recognized laboratory, such as the Gemological Institute of America (GIA) or the American Gemological Laboratories (AGL), may request one at their own expense or hire an independent adviser of their choosing. Watch Descriptions and Condition Reports: The physical characteristics, timing accuracy or functionality of timepieces cannot be guaranteed, and all items are sold as-is. Any condition statement reflects the condition of the watch on the date of the report. Condition can change from the time of the report to the day of sale. Photographs are for identification purposes only. Buyers may not use them as precise indications of size or condition. The origin or authenticity of all components cannot be guaranteed. Watches with waterproof or water-resistant cases – MORPHY’S may open cases to develop descriptions, and cannot guarantee that any watch is waterproof or water-resistant at the time of purchase. MORPHY’S recommends that the buyer have a professional watchmaker evaluate the watch at buyer’s expense. Buyers must be aware that watches may need general service, change of battery, or further repair work for which the buyer is solely responsible. Dials – All watches have the possibility that after their original date of manufacture they received reconditioning or replacement of dials or elements of the dial such as but not limited to standard or luminescent hour markers, hands, script, date or measurement indices, lacquer, and finish. Buyer is solely responsible for determining and understanding such condition issues. The lack of a condition report does not imply that the item or lot is free from imperfections, defects or wear and tear of the aging process. This includes but is not limited to: deficient stones, needed repair or defects. It is common and generally accepted in the jewelry industry that some diamonds and most gemstones have been enhanced with various treatments to improve their overall appearance. These treatments include but are not limited to: heating, dying, oiling, laser drilling, HTHP, wax, bleaching, irradiation, resin or polymer impregnation and various other techniques. Unless stated in the title, it is assumed that one or more treatments have been performed to the stones. While many treatments are considered permanent, this cannot be guaranteed. Please note that many treatments cannot be determined without sophisticated laboratory testing. Due to the various laboratories and developing scientific methods for testing, not all reports or certificates will have the same results for treatment type, extent of treatment and stability of treatment. MORPHY’S makes no representations or warranties, express or implied, as to whether natural stones have been treated or enhanced, whether specifically referenced or not. If a lot is accompanied by certificates or reports from internationally recognized and accepted gemological laboratories, it will be noted in the description. Copies will be available upon request, with the original going to the successful bidder. The reports cannot be guaranteed and are provided for informational purposes only. Results on reports may differ from laboratory to laboratory. MORPHY’S accepts no responsibility for the accuracy, terms or information contained in such certificates or reports. The auctioneer will determine the highest bidder. The auctioneer alone has the right to reopen the bidding of an item if deemed necessary due to a dispute. If there is a tie bid between the floor and Internet or absentee bid, the floor bid takes precedence. MORPHY’S and its representatives reserve the right to remove those attendees who impede preview and/or the auction. Title to all merchandise shall pass to the highest bidder at the fall of the auctioneer’s hammer. The buyer will then assume all risk and full responsibility of the lot purchased once ownership has changed. We recommend that you arrange insurance for your items immediately upon becoming the highest bidder. MORPHY’S is not responsible for any errors in bids, omissions of bids, or failure to execute bids and shall have no liability to any bidder for any technical or other failure associated with the internet, absentee bidding, or telephone bidding. ABSENTEE BIDDING – MORPHY’S will accept absentee bids if pre-authorized by mail, fax or through morphyauctions.com online. Absentee bidders must use the absentee bid form and clearly mark the lot number, title and maximum bid amount. Absentee bidding forms may be accessed online at www.morphyauctions.com. If there are two (2) identical bids placed on the same item, priority will be given to the first bid received. All bids must be left in increments as explained on our bid form. If a bid is “out of increment,” the auctioneer has the right to round the bid up to the next correct increment. Bidders may preview, register and place bids online through our website, www.morphyauctions.com. Absentee and online bids placed through www.morphyauctions.com will be auto charged to the credit card entered 48 hours after the end of the sale. If you wish to pay by another method please contact us within 48 hours after the sale. Seller(s) agree to allow the Auctioneer to accept and execute absentee bids in a competitive manner for potential buyers and under the MORPHY’S absentee bidding terms and conditions. During the live sale, the auctioneer will execute your absentee bid competitively up to the maximum amount you have indicated. ONLINE BIDDING – Online bidding through www.morphyauctions.com, Live Auctioneers, Invaluable, Proxibid, or other bidding platforms may be available; all Terms and Conditions still apply. A surcharge will be added for third party online platforms. Refer to your bidding platform of choice for the final buyer’s premium. If there is a tie bid between the internet bidding venues and the floor, the floor bid takes precedence. If a credit card has been provided to one of the online bidding platforms, MORPHY’S reserves the right to use and charge the credit card if the winning bidder has not paid via another method by the 7 day term in Payment Terms below. Due to our fast paced auctions and bids coming from floor bidders, phone bidders, internet bidders and absentee bids, the auctioneer has the final word on all item(s) sold. You (the bidder) assume the risk of winning an item online and not having the item actually sell to you. This is due to the final call of the auctioneer and the operator not being able to re-open that lot. Online bidders are responsible for accidental bidding as if they bid normally. BID RESULTS – MORPHY’S will only contact successful bidders. Please allow 24-48 hours post auction to receive your official invoice from MORPHY’S. The invoice will include item, hammer price, premium, packing and handling, shipping, insurance, and any other charges that apply. Please hold phone inquiries regarding bid success until after receiving your invoice. For verifications, MORPHY’S cannot provide winning bid information until the second business day after the auction. MORPHY’S will not provide bidder information to any outside sources. TELEPHONE BIDDING – Requests for phone lines must be received at least three (3) days prior to the auction date. MORPHY’S cannot guarantee phone lines but will make every attempt to accommodate those who wish to participate through that method. Phone lines are provided on a first come first served basis. Please visit www.morphyauctions.com or call 717-335-3435 to request a call from our representatives during the live auction. Bid increments listed are a general guideline. Actual increments are at the auctioneer’s discretion. If a lot does not receive a bid of 50% of the low estimate, the lot will be passed by the auctioneer. A 23% buyer’s premium will be added to all successful bids and is payable by the buyer as part of the total purchase cost. If payment by cash, check, money order or wire transfer is made within 7 days of the invoice a 3% discount may be taken on the Hammer price by the buyer. DISCOUNT IS ONLY AVAILABLE IF INVOICE IS PAID WITHIN 7 DAYS from the sale date. Split payments are subject to a 23% buyer’s premium if a credit card is used as any form of total payment. A surcharge will be added for any third party online bidding platform that the bidder utilizes. Refer to your bidding platform of choice for the final buyer’s premium. Lots delivered to you, or your representative are subject to all applicable state and local taxes, unless appropriate permits are on file with MORPHY’S. Bidder agrees to pay MORPHY’S the actual amount of tax due in the event that sales tax is not properly collected due to: 1) an expired, inaccurate, or inappropriate tax certificate or declaration, 2) an incorrect interpretation of the applicable statute, 3) or any other reason. The appropriate form or certificate must be on file at and verified by MORPHY’S five days prior to Auction, or tax must be paid; only if such form or certificate is received by MORPHY’S within 4 days after the Auction can a refund of tax paid be made. Lots from different auctions may not be aggregated for sales tax purposes. Any invoice totaling more than $100,000 and all watch sales must be paid within three (3) days. All other merchandise must be paid in full within seven (7) days of the date of the invoice. If payment by cash, check, money order or wire transfer is made within 7 days of the invoice, a 3% discount on the Hammer price may be taken by the buyer. DISCOUNT IS ONLY AVAILABLE IF INVOICE IS PAID WITHIN 7 DAYS from the invoice date. No discount is permitted on split payments where a credit card is used as any form of total payment. Payments can be made by going to your account online at www.morphyauctions.com, call 877-968-8880 or mail payment to: Dan Morphy Auctions LLC 2000 N Reading Rd, Denver, PA 17517. Interest will be charged on all balances not paid at the rate of 1-1/2% monthly (18% APR) effective 30 days from the invoice date. All goods not retrieved by Buyer within 30 days after the invoice date, shall be subject to a storage fee of $50 per regular sized item per month or $100 per oversized item per month. Buyer authorizes the MORPHY’s to sell, at their standard commission and consignment contract terms, any goods not retrieved after a 90 day period in any manner deemed appropriate by MORPHY’s and the proceeds will be applied to any outstanding balance due from the buyer. Absentee bids placed through www.morphyauctions.com will be auto charged to the credit card entered 48 hours after the end of the sale. If you wish to pay by another method please contact us within 48 hours after the sale. We accept Visa, MasterCard, Discover, American Express, personal checks, certified checks, wire transfers, money orders, and cash. Jewelry, Watches, Coin and Currency Auctions – We accept cash, wire transfer, check, certified checks and money orders only. No credit cards. CREDIT CARD – We will not accept credit card payment for any jewelry, watch, coin or currency auction purchases. For first time buyers and credit card charges greater than $2,500 buyers must complete the bottom portion of the invoice and must specifically sign the acknowledgement of our terms of sale before we will accept payment via credit card. We do offer the convenience of paying automatically by credit card. If you wish have your card automatically charged for all purchases please complete our “Authorization for Automatic Credit Card Use.” We have this form available online or upon request. Split payments are subject to a 23% buyer’s premium if a credit card is used as any form of total payment. CHECK – There will be a $30 service charge for returned checks. Make checks payable to: Dan Morphy Auctions LLC. MORPHY’S reserves the right to hold items paid for by personal or company check until said check clears (14 days). MORPHY’S has the right to hold all checks over $2,000. Customers who have an established successful buying history with MORPHY’S may be exempt from this. We will accept a personal or company check >$2,000 and/or from a first time buyer if you provide a Bank Letter of Credit, available on our website, morphyauctions.com. WIRE TRANSFERS – There will be a $30 charge added to all wire transfers less than $2,000. Please add this amount to your invoice total before sending a wire transfer. In the few situations where a successful bidder does not remit payment when due, MORPHY’S will proceed with the legal steps necessary to protect its interests and will block the bidder from future auction participation. It is the bidder’s responsibility to take shipping, handling, and insurance costs into consideration when bidding on items. BIDDERS PRESENT AND TAKING ITEMS AFTER AUCTION – Since item liability transfers upon a successful bid, items paid for must be packed, transported and/or removed by the buyer at his/her own risk after the close of the sale. We recommend that you arrange insurance for your items immediately upon becoming the highest bidder. If any employee or agent of MORPHY’S shall pack or transport the merchandise, it is fully at the risk and responsibility and expense of the buyer. MORPHY’S shall not be held liable for any loss or damage that may be caused by the said agent or employee. ITEMS NOT PICKED UP THE DAY OF THE SALE – Packaging, shipping, and insurance on all items that MORPHY’S accepts for shipment to locations that can accept shipments will be made available as an added courtesy and at an additional cost. We recommend that you arrange insurance for your items immediately upon becoming the highest bidder. All applicable charges will be applied to the invoice. Shipping will be based on actual costs via FedEx, USPS, or other carriers required based upon the contents of the shipment. Packaging and insurance will vary in cost depending on the items on each invoice. All packages will be shipped with insurance. Standard items packed internally by MORPHY’s will ship seven to fourteen (7-14) business days after payment is received. Oversize and breakable items, which MORPHY’s will indicate on the invoice, will ship based upon the buyer’s arrangement with a 3rd party shipper. MORPHY’s cannot combine standard item shipments with oversize and breakable item shipments. Again, if any employee or agent of MORPHY’S shall pack or transport the merchandise, it is fully at the risk and responsibility and expense of the buyer. MORPHY’S shall not be held liable for any loss or damage that may be caused by the said agent or employee. SHIPPING TERMS – MORPHY’S will ship items to the buyer at the listed address via FedEx or other carriers, FOB Denver, Pennsylvania or FOB Las Vegas, NV or FOB other auction locations. Any risk of loss or damage to the item(s) during transit via FedEx, or any other carrier, in excess of the insurance provided by or purchased from MORPHY’S, is at the risk of the buyer. Any additional insurance coverage should be purchased by the buyer through the carrier. Buyer releases MORPHY’s from any and all claims for loss or damage to any item during transit and agrees to pay all costs of defense, including attorney’s fees, for any claims brought against MORPHY’S for loss or damage occurring during transit. INSURANCE – Shipping insurance is automatically added, which you can decline by contacting us and providing a signed waiver of insurance form. Insurance for all 3rd party shipments must be arranged through that carrier. Insurance provided or purchased through MORPHY’s applies only to shipments to the United States and Canada. Buyers must purchase their own insurance for shipments to other countries. INTERNATIONAL SHIPMENTS – MORPHY’S has the capability to ship to international bidders. By law, MORPHY’S cannot, and will not, declare lesser values for any international purchases and all shipments will include the invoice with purchase totals including the buyer’s premium and shipping cost. All international bidders are responsible for knowing their country’s laws on importing items and for paying all customs and duties on the items. 3RD PARTY SHIPPING OF OVERSIZE ITEMS –Buyers will need to either pick up the items personally or arrange a 3rd party shipping service for oversize items. As a general guideline, the following will indicate which packages apply, as they are of a certain weight, length, or dimensional size. There may be certain shipments that meet these requirements that will still require 3rd party shipping, and we will communicate the reason in those cases. STORAGE FEE – MORPHY’S will charge a storage fee of $50 per item per month for any items awaiting pickup for more than 30 days following the invoice date. Buyer authorizes the MORPHY’s to sell, at their standard commission and consignment contract terms, any goods not retrieved after a 90 day period in any manner deemed appropriate by MORPHY’s and the proceeds will be applied to any outstanding balance due from the buyer. MORPHY AUCTIONS, LAS VEGAS LOCATION ONLY SPECIAL COURTESY – Items purchased at our Las Vegas location may qualify for free shipment on our freight truck to Denver, PA.
To be considered for shipping, all item invoices must be paid in full by day 7 after the auction, or they will not be shipped on the truck and shipping charges will then apply. Items will leave Las Vegas approximately 14 days after the auction date. Upon arrival in Denver, PA the buyer must pick items up within 14 days, or a $50/week storage fee will apply. Buyers will be contacted by phone or email when items arrive in Denver, PA. It is the buyer’s responsibility to pick the items up here. For packages to qualify for courtesy shipping, at least one piece or all pieces together in a package, must have a dimensional size of more than 130 square inches. Dimensional size is length (the longest measurement) + (height x 2) + (width x 2). For example, a 36” x 36” x 12” package = 36 + (36 x2) + (12 x 2) = 132. I hereby understand and agree that any controversy or claim arising out of or relating to MORPHY’S Bidder Terms & Conditions, which includes this provision (hereafter referred to as “Terms & Conditions”), MORPHY’S, or the breach thereof (hereafter referred to as “Claims”), shall be governed by and construed in accordance with the laws of the State of Pennsylvania, without regard to its conflict of law provisions. I hereby irrevocably submit to the personal jurisdiction of the appropriate court in Lancaster County, Pennsylvania in any action or proceeding arising out of or relating to the Claims and their enforcement, and I agree that any and all Claims must be adjudicated, heard, determined, and resolved in said court, and I hereby irrevocably waive any objection on the ground that any such action or proceeding in said court has been brought in an inconvenient forum. MORPHY’S failure to exercise or enforce any right or provision of these Terms & Conditions or any other legal rights, shall not constitute a waiver of such right or provision. Any waiver of any provision of these Terms & Conditions by MORPHY’S must be made in writing and signed by an authorized representative of MORPHY’S specifically referencing the provision(s) contained within the Terms & Conditions to be waived. Headings used in the Terms & Conditions are for convenience only and are not to be relied upon. If any provision of the Terms & Conditions is found by a court of competent jurisdiction to be invalid, the parties nevertheless agree that the court should endeavor to give effect to the parties’ intentions as reflected in the provision, and the other provisions of the Terms & Conditions shall remain in full force and effect. These Terms & Conditions will inure to the benefit of, and are intended to be, enforceable by MORPHY’S, its parents, subsidiaries, affiliates, successors, assigns, members, directors, officers, and licensees. There are no third party beneficiaries to these Terms & Conditions; a person or entity who is not a party or signatory to these Terms & Conditions has no rights under the Contracts (Rights of Third Parties) Act 1999 to rely upon or enforce any term or provision of these Terms & Conditions. MORPHY’S engages knowledgeable experts to provide catalog descriptions on the merchandise we sell. Every effort is made to ensure those descriptions are accurate and that they fully disclose any exceptions to condition. Any buyer who has made their payment within the due date of 7 calendar days who wishes to report a problem must notify MORPHY’S within three calendar (3) days of receipt of their purchased item. Buyers who have not made their payment within the due date of 7 days may not return any items under any circumstances. No lots purchased by floor bidders (including those bidders acting as agents for others) may be returned. A Return Merchandise Authorization Number (RMA#) must be issued by MORPHY’S before you ship anything back to our address. Any items arriving without a return authorization will not be given a refund. The item in question must be shipped with the RMA# on the outside and inside of the package, with full insurance, so it arrives at MORPHY’S within one week of the aforementioned authorization. All rights reserved. Entire contents copyright 2018, Dan Morphy Auctions LLC. Copyright includes, but is not limited to, print media, microform and electronic media, such as CD-ROMS and online computer services.